A blessed Earth Day to all. 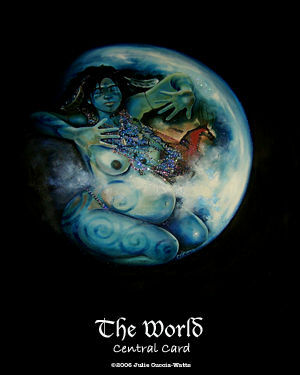 The World from the Maat Tarot (by Julie Cuccia-Watts). On Saturday, we spent a wonderful afternoon hiking on trails near the town where we live. 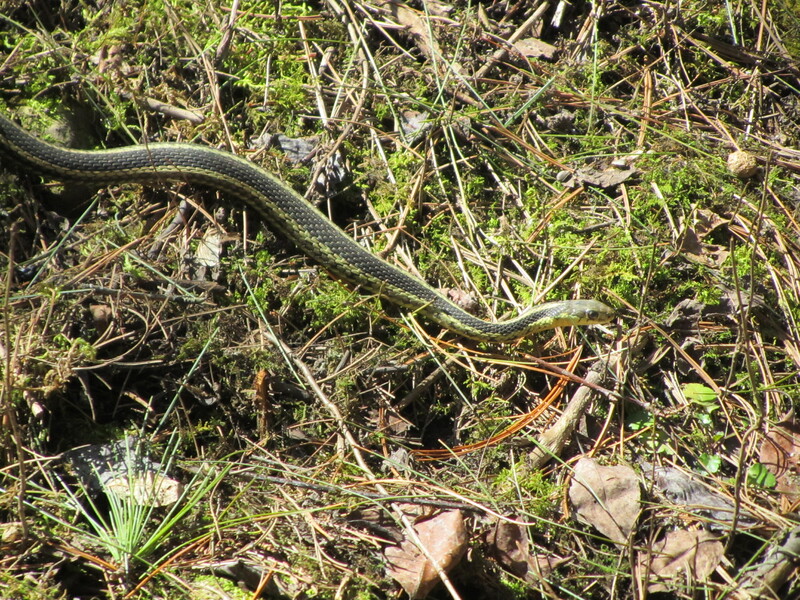 Encountering garter snakes, hawks, chickadees, frog song, and pine scent was revivifying. It brought to mind a very simple evolutionary tarot practice for all of us to carry out from time to time. Spend at least two hours out of doors in the bosom of Nature. Afterwards, take Trump XXI (the World, the Universe, Gaia, Kosmos…) from your tarot deck and spend five to fifteen minutes simply contemplating it. Notice what emerges. Journal about it. What do you learn about life? What do you learn about tarot? What do you learn about yourself? To what, if anything, do your insights call you? Put XXI back into the deck and get on with the day. One of the beautiful beings we encountered on Saturday. The Kosmos (XXI) from the Tarot of Transformation. The suit of Coins, Pentacles, or Earth relates to anything physical, tangible, material, or grounded. The suit of Swords or Air relates to anything mental, philosophical, communicational, or thought-based. 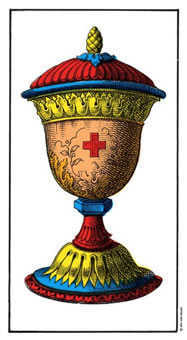 The suit of Cups or Water relates to anything emotional, relational, intuitive, or collaborative. 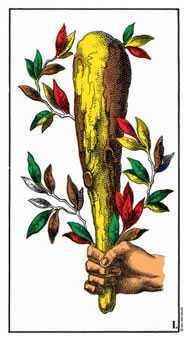 The suit of Wands or Fire relates to anything spiritual, identity-based, growth-oriented, or self-expressive. The Trumps or Major Arcana relate to the universal, all-encompassing, archetypal, or transpersonal. Either once a day or once a week, mix your tarot deck while holding the intention to know what aspect of life to focus on that day or week. Select one card at random. Notice which of the five parts of the pack its from and its corresponding piece(s) of life. The invitation is to pay closer attention to that piece(s) of life to learn more about yourself and to learn more about existence. The card can also suggest doing something to enliven or feed that part of you. Simply observe that part of life and do something related to it. If you drew a Swords card, pay attention to your mind, your words, and what you read. A Swords card can also suggest awakening/supporting the mind: read an inspiring text, learn a new word, sign up for a course, remove an unwanted sentence from your vocabulary. Notice at what stage/step in the suit the card falls. Is it close to the beginning (Ace, Two…) or near the end (…Queen, King)? In addition to paying attention to that aspect of life, do something that’s as simple or as advanced as the stage/step suggests. 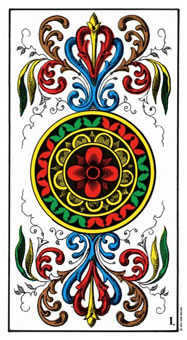 For example, the Ace of Pentacles might suggest walking once around the block or checking your bank account. The Queen of Pentacles, being much further along in the suit, can indicate doing something more rigorous for the body or learning a more advanced accounting process. Again, you can take note of the stage/step. Let the number or court invite a specific number of actions or components connected with the suit. For example, the 5 of Cups might invite you to spend time with five close friends or relatives. It might also challenge you to come up with five things to do that will nourish you emotionally. 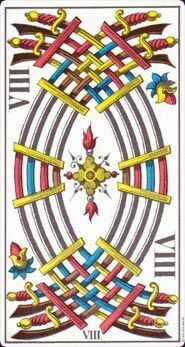 The King of Wands, as the 14th card of the suit, might ask you to create 14 avenues of self-expression and spiritual connection. What do you do if you pull a Trump/Major? Pay attention to and awaken EVERY aspect of yourself in addition to everything BEYOND yourself. Not only is the suggestion to learn from and energise every part of yourself, you’re being called to contribute to your community, your culture, our world, our cosmos! There, isn’t that easy? You only need to know those five things then let your powers of observation and imagination do the rest. So…what’s your card? To what does it call your attention? What will you do to nurture that piece(s) of your life? Please tell us in the Comments…we’re listening to you here. 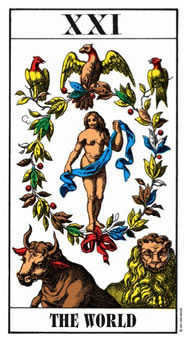 Images: The four Aces and the World card from the 1JJ Swiss Tarot. Two days ago, someone hacked into my email account and sent around a silly message saying that I was stuck in the Ukraine and needed money. What a load of rubbish. To say I was unhappy would be an understatement. What am I to learn from the hacking experience? XXI, The World, reversed. I am learning to have a deeper choice-centred attitude, to remember that I rule my own inner world. How can I best integrate this learning? 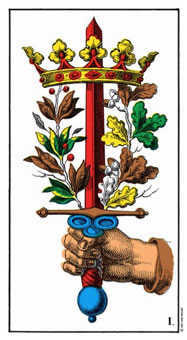 8 of Swords, upright. I can use this as an opportunity to pare down my network, prioritise whom I choose to communicate with, reduce negative thinking, and tighten up my community. The action I took based on this reading was to create a new email address (you can see it below) and to begin adding only those people to the list with whom I feel kinship. This is a chance for me to choose resonant community and it feels deeply empowering. What a gift to shift from “what the hell is this” to “what an opportunity”! I appreciate how engaging with the tarot can bring me back to my centre, offer helpful perspectives, and root me in choice. Aahh!!! Such an experience can do the same for YOU too, so feel free to contact me for a consultation(s). Some say that it takes a minimum of 66 days to make or break a habit, 66 days to rid yourself of something you no longer want to be, do, or have or to acquire something to be, do, or have. The tarot trumps (Major Arcana) are 22 in number. If you spent three days per card, beginning with the Fool and ending with the World, you would integrate greater knowledge of the tarot and, more importantly, a richer understanding of yourself. Day One with each card could be about the physical, Day Two about the mental, and Day Three about the spiritual. Spend five minutes looking at the card while breathing slowly and rhythmically in and out. Pose like the main figure/character in the card. Move or excercise like the main figure/character in the card would move or exercise. Prepare and eat a food item that you feel relates to the card. Wear an item of clothing whose colour figures prominently in the card. Contemplate the card’s name. Why might it be called what it is called? Find a proverb, quotation, or aphorism that you feel relates to the card. Commit it to memory and recite it to yourself throughout the day. Write a poem or short story based on the card. Jot down the symbols and characters you notice in the image. Write your own associations for each of them, then look up ideas about each of them in a dictionary of symbols. Ask yourself how the card reminds you of your own life thus far. What about it do you choose to discard or change? What about it do you choose to retain and build upon? Imagine this card as an aspect of your True/Great Self. What does this tell you? Imagine this card as an aspect of the Divine. What does this tell you? Compose a prayer based on the card, then recite it several times over the course of the day. Imagine performing this three-day pattern as a 66-day pilgrimage with the 22 Major Arcana. What would your version of this look like? How might it contribute to your evolution? What would emerge? Please let me know. P.S. 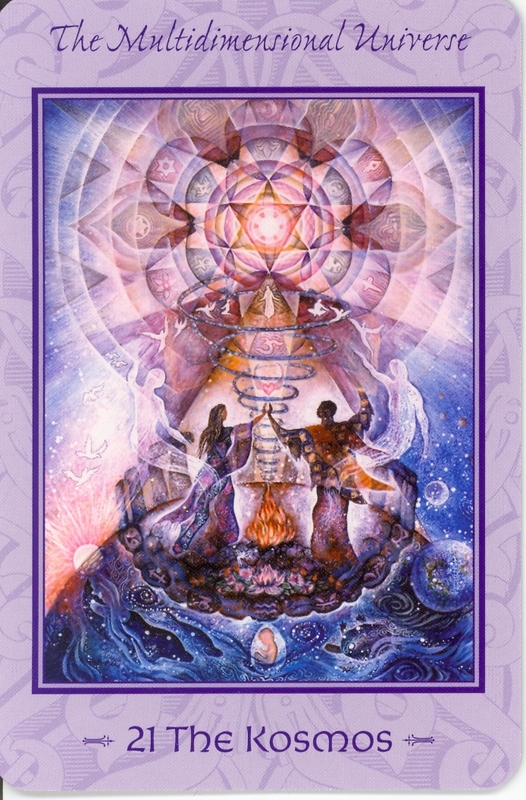 This process would also work well with the Oracle of Initiation by Mellissae Lucia, a gorgeous non-tarot deck that contains 66 cards. You could do all three levels — physical, mental, and spiritual — each day with one card per day. Hmm…what is it about the number 66 these days?